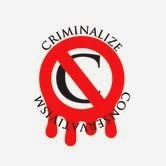 Criminalize Conservatism: Are We Watching the GOP on the Verge of Collapse? Are We Watching the GOP on the Verge of Collapse? "Mark Twain wrote that 'history doesn’t repeat itself, but it does rhyme.' For the Republican Party, 2014 may end up sounding a whole lot like 150 years ago, and we might be seeing the end of the conservative party, as we know it. "In 1864, prior to the end of the Civil War, a faction of radical Republicans believed President Lincoln was incompetent, and therefore unelectable. These anti-abolition extremists broke away from the establishment under the name Radical Democracy Party, while Lincoln and establishment Republicans created the National Union Party with the intent of attracting War Democrats and Border State Unionists who would not have ordinarily voted for the Republican Party. "The party nominated incumbent President Lincoln alongside a Democrat - Andrew Johnson. The rebranded establishment ticket went on to win the 1864 election in a landslide, and the radicals were brought back to the fold under the Republican Party brand shortly thereafter. 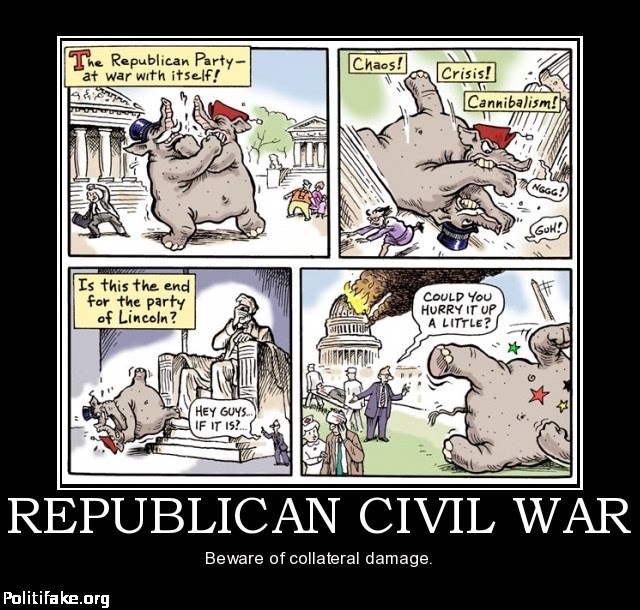 "We may be witnessing the genesis of another temporary or permanent fracture of the Republican Party, for what was once a happy coalition of secular and social conservatives, united to defeating Obama and liberalism, has turned into an openly hostile civil war for control of party, and by all measures the Christian Right/Tea Party faction are winning in their objective of purging what they believe are Republicans In Name Only. "The highest ranking Republican in the Senate, Mitch McConnell, is under siege from the far right with lobbying groups Freedom Works, Madison Project, and the Senate Conservatives Fund spending up big in an effort to tear down the senior Senator from Kentucky. 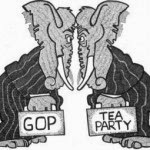 Fox News contributor and Red State blogger Erik Erickson writes, 'Defeating McConnell is essential to asserting the Tea Party’s dominance over the Republican Party.' In latest polls, McConnell’s opponent leads by 4 points. "After suffering a heavy defeat in the 2012 election, establishment Republicans believed the sure fire way to wrestle control of the party back from the clutches of the unelectable Christian Right/Tea Party was to raise enough Wall Street and Chamber of Commerce cash to crush the social conservative moment. But that plan has gone awry given the Federal Electoral Commission revealed that Tea Party and social conservative groups raised nearly three times as much as GOP establishment groups in 2013. "The fact Christian Right stalwart Mike Huckabee leads in a hypothetical poll against fellow 2016 GOP hopefuls says much about which direction the ideological war is heading, too. "This is a war establishment Republicans cannot win for not only is the Christian Right/Tea Party faction the most reliable and agitated voting bloc within the party, but also they’re now out raising Chamber of Commerce-sponsored establishment candidates thanks to a cabal of hyper-religious organizations, the Club for Growth, and the Koch brothers. Since August, the Koch’s Americans for Prosperity has spent more than $27 million on ads, which puts it on pace to outstrip its overall $38.5 million spent on the 2010 election. 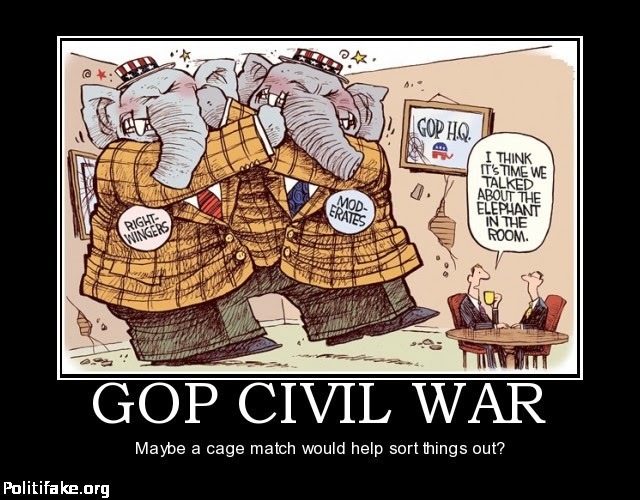 "When establishment Republicans realize the unwinnable war is lost, they’ll be faced with one of three options: either declare allegiance to the theocratic, neo-confederate, social conservative base or join the likes of fellow Republicans who have voluntarily departed the party to become Democrats or independents, or rebrand under another party name like Lincoln had in 1864. In other words, the party is over." Is the party really over for the Conservatives or has GOP gerrymandering insured their majority in the House? We think that the GOP will be here for awhile at least. But he also said, "Nature has made some men monarchists and tories by their constitution, and some, of course, there always will be (Thomas Jefferson to Albert Gallatin, 1817. ME 15:135. )," and unless Conservatism is criminalized, he might have added, these anti-American criminals will soon be with us again in another form. guy can't hit a deer in one shot, he sure as Hell isn't much of hunter." Barry Goldwater, GOP Senator from Arizona.